Mobility is the epitome of technology. Till date there has been no place offering cleaner fuel technology which accommodates EV's (Electric and Hybrid vehicles). 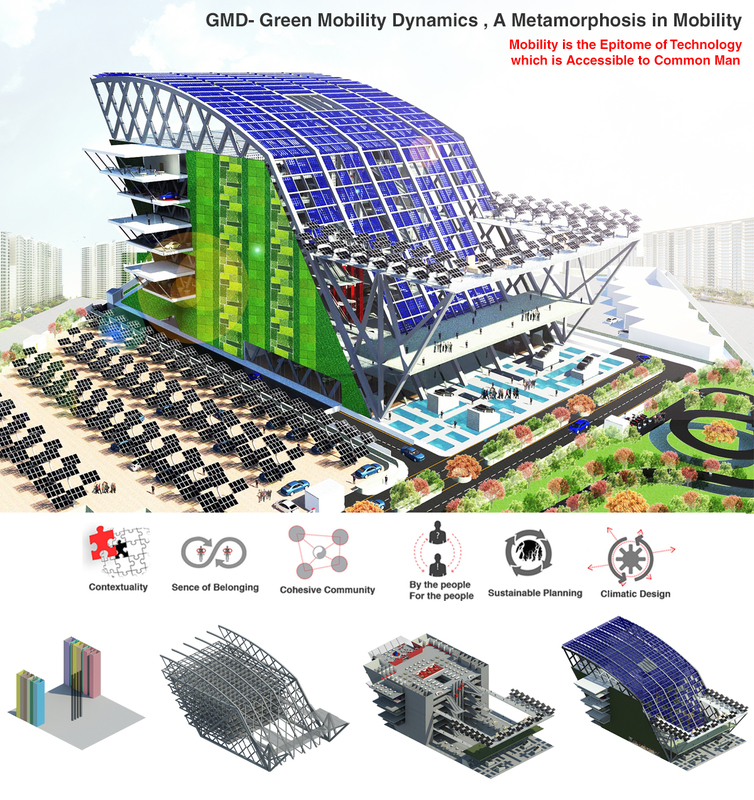 GMD is a technologically advanced "specialty" building catering to buying capacities of different strata of society. It’s a concourse of eco kinetics which has a sustainable approach in the future in terms of the physicality as well as the thought which saves the non-renewable resources of energy.. This Centre will not only cater to Cars in total but will also cater in the electric and hybrid 2 and 3 wheelers also. This building will house all the information and vehicles on which people can do ample amount of research work in order to zero on, to their need and liking of an automobile. The Scheme and Site Planning was done to benefit the Community living in or around it thus providing a ONE-STOP SOLUTION for all the buyers where various brands of EVs (electric and hybrid vehicles) are UNDER ONE ROOF. This will give a unique experience to the client wherein he will get all the facilities from buying vehicles to modifications, accessories, finance, insurance and RTO at one place, thus saving time while having a complete peace of mind. Vehicular Pollution the Cause, Green Mobility Dynamics the Remedy.